Abbey Road – Cover Inspiration? Last month saw the 45th anniversary of the day the famous Abbey Road cover photo was taken. 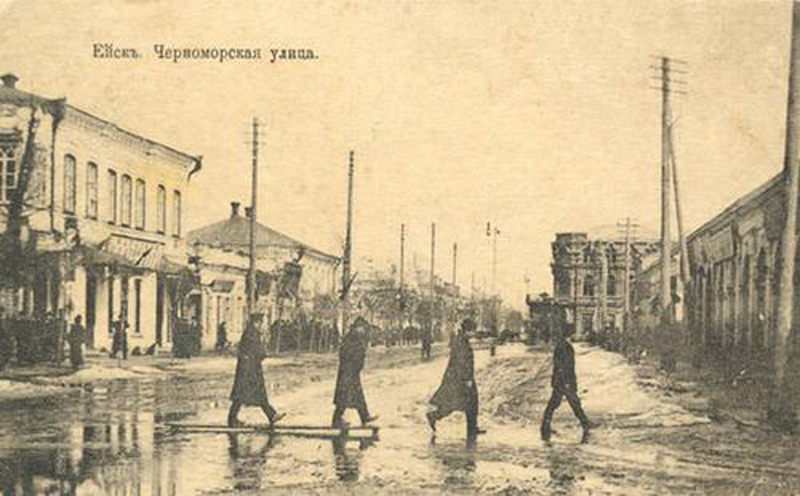 An interesting image has been sent to us by Beatles Blog reader Andrey (the dedicated Beatles collector and expert in Russia): Andrey says it was taken at the turn of the 20th century – in the Russian city of Yeysk on Chernomorskaya Road (Black Sea Road)! Could Paul McCartney (who had the initial idea for the Abbey Road album cover) or photographer Iain Macmillan possibly have seen this archival photo and used it as their inspiration? Probably not – but it’s fun to dream…..
By the way, Andrey helps to keep this fantastic site up-to-date. It is an absolutely comprehensive guide to all the Beatles‘ Russian vinyl releases. As usual it’s a thoroughly researched site. So far only the years 1964-1971 are ready but Andrey recommends a look at this chapter on all the printed music which has been released in his country. It details everything he has found so far. The very first edition is from the Soviet Estonia. Andrey’s research on the song “Yesterday” is here (complete with videos). This entry was posted in Abbey Road, Beatles, Record Covers and tagged 45th Anniversary, Abbey Road, Abbey Road album cover, Beatles, Cover Photo, Russian Beatles by beatlesblogger. Bookmark the permalink.